Western blot analysis of extracts from OVCAR8 cells, transfected with 100 nM SignalSilence® Control siRNA (Unconjugated) #6568 (-), SignalSilence® HER3/ErbB3 siRNA I #6504 (+) or SignalSilence® HER3/ErbB3 siRNA II (+), using HER3/ErbB3 (1B2E) Rabbit mAb #4754 (upper) or α-Tubulin (11H10) Rabbit mAb #2125 (lower). 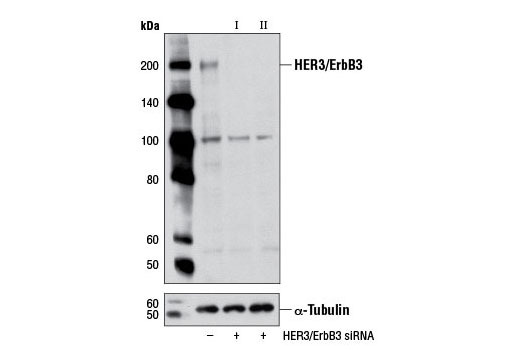 The HER3/ErbB3 (1B2E) Rabbit mAb confirms silencing of HER3/ErbB3 expression, while the α-Tubulin (11H10) Rabbit mAb is used as a loading control. CST recommends transfection with 100 nM HER3/ErbB3 siRNA II 48 to 72 hours prior to cell lysis. For transfection procedure, follow protocol provided by the transfection reagent manufacturer. Please feel free to contact CST with any questions on use. SignalSilence® HER3/ErbB3 siRNA II from Cell Signaling Technology (CST) allows the researcher to specifically inhibit HER3/ErbB3 expression using RNA interference, a method whereby gene expression can be selectively silenced through the delivery of double stranded RNA molecules into the cell. All SignalSilence® siRNA products from CST are rigorously tested in-house and have been shown to reduce target protein expression by western analysis. HER3/ErbB3 is a member of the ErbB receptor protein tyrosine kinase family, but it lacks tyrosine kinase activity. Tyrosine phosphorylation of ErbB3 depends on its association with other ErbB tyrosine kinases. Upon ligand binding, heterodimers form between ErbB3 and other ErbB proteins, and ErbB3 is phosphorylated on tyrosine residues by the activated ErbB kinase (1,2). There are at least 9 potential tyrosine phosphorylation sites in the carboxy-terminal tail of ErbB3. These sites serve as consensus binding sites for signal transducing proteins, including Src family members, Grb2, and the p85 subunit of PI3 kinase, which mediate ErbB downstream signaling (3). Both Tyr1222 and Tyr1289 of ErbB3 reside within a YXXM motif and participate in signaling to PI3K (4). Investigators have found that ErbB3 is highly expressed in many cancer cells (5) and activation of the ErbB3/PI3K pathway is correlated with malignant phenotypes of adenocarcinomas (6). Research studies have demonstrated that in tumor development, ErbB3 may function as an oncogenic unit together with other ErbB members (e.g. ErbB2 requires ErbB3 to drive breast tumor cell proliferation) (7). Thus, investigators view inhibiting interaction between ErbB3 and ErbB tyrosine kinases as a novel strategy for anti-tumor therapy. Guy, P.M. et al. (1994) Proc Natl Acad Sci U S A 91, 8132-6. Songyang, Z. et al. (1993) Cell 72, 767-78. Kim, H.H. et al. (1994) J Biol Chem 269, 24747-55. Sithanandam, G. et al. (2003) Carcinogenesis 24, 1581-92. Kobayashi, M. et al. (2003) Oncogene 22, 1294-301. Holbro, T. et al. (2003) Proc Natl Acad Sci U S A 100, 8933-8.